Adidas took the research and development strides made by TaylorMade Golf and fed the knowledge learned to its research lab outside of Boston, expanding on TaylorMade’s RocketBallz technology to design a new carbon fiber baseball bat, the EQT x3 RBZ. TaylorMade Golf studies swing—they know materials, weight distribution, how to leverage carbon fiber and maximize airflow. Adidas took the research and development strides made by TaylorMade and fed the knowledge learned to its research lab outside of Boston, expanding on TaylorMade’s RocketBallz technology to design a new carbon fiber baseball bat, the EQT x3 RBZ. With such tight regulations placed on non-wood bat performance, John Byrne, Adidas’ director of hardgoods, tells SI.com, that the company focused on creating a bat that players could get through the zone faster than other competitors. TaylorMade introduced the RBZ technology in golf clubs and has since applied it to hockey sticks; now baseball bats are seeing the application of carbon fiber to minimize weight and maximize strength. How does it translate to a bat? For baseball, power comes in the form of the high-strength, low-weight property of carbon fiber and speed comes in a balanced bat that allows for a faster swing. ​Looking at the carbon in the barrel, the angling allowed Adidas to play around with weighting. While Adidas—and plenty of others—have long offered aluminum bats and bats with composite materials, going all carbon offers engineers a new wealth of options. Using TaylorMade software technology to simulate the flow of air over the barrel, engineers optimized the barrel profile too, with a long, straight section. “With carbon, changing the layers, how you orient, you can play with how long that sweet spot can be,” Byrne says. Removing the threat of an end-heavy bat, all within the specs dictated by governing regulations, allows players to get the bat through the zone quicker. ​What other materials are involved? 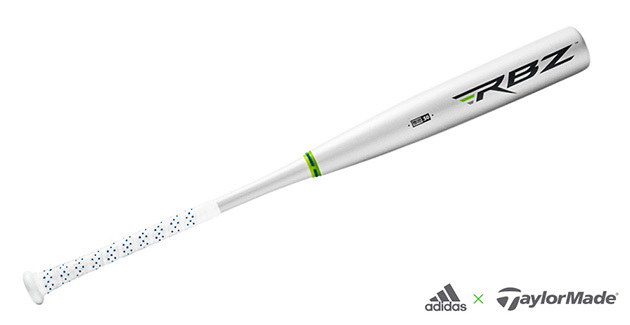 At the lower end of the bat’s barrel, where the carbon connects with the handle, Adidas built in what it calls an Energy Recoil System to dampen vibration and the wasted energy that comes with it. Adidas launched the EQT x3 RBZ at the College World Series in Omaha and plans for a summer roll-out of the bat, built to the specifications that make it legal in the NCAA and high school leagues. Expect added variations in the future that fit regulations for all age groups.